In November 1980, Craig Lesser and I visited the 16th Gyalwa Karmapa, Ranchung Rigpa Dorje, in Boise, Idaho. It was arranged as a formal meeting between Adi Da Samraj (then Da Free John) and Adidam, (then known as the Advaitayana Buddhist Fellowship), and the 16th Karmapa, Ranjung Rigpe Dorje and the Karma Kagyu tradition. Adi Da Samraj asked us to have this meeting on His behalf. The 16th Karmapa was known to be a very great Realizer, with a broad sense of humor and one the greatest Spiritual Beings of the 20th century. Craig Lesser was friends with a woman named Barbara Pettee who lived in Palo Alto and worked with many lamas (Skt. gurus) of the Tibetan Buddhist tradition. The meeting was arranged by her. Boise, Idaho was chosen specifically because we felt that because it was a smaller city, not as much would be going on with the Karmapa, and therefore he would have more available free time. It was a cold and icy time in Boise, with white snow on the ground all around. We arrived by airplane and spent the night at a local hotel. The next day we traveled over to a house that was the Center of Namgyal Rinpoche, known as the Open Path Dharma Centre. The Karmapa was not staying there, but was using it as a place for meetings. Adi Da Samraj had Requested that we make this contact and connection. He had been speaking a great deal about Buddhism and its three yanas, and He had dubbed the Reality-Way of the Heart, Advaitayana Buddhism. This is of course described at length in the book Nirvanasara. It was the fourth turning of the wheel of the law or dharma, a new and unique Revelation by Him. But He felt that it could be seen as a form of Buddhism, a new and unique form, and therefore He felt that it was appropriate for us to visit with Buddhist leaders to discuss all of this. He wanted us to make links. A full outline or “script” for the meeting was prepared by me, and the typed version of this was given to Adi Da for His Approval and Blessing. There were many Notes and discussions about how the meeting should be conducted, and I felt well-instructed and prepared to represent Bhagavan Adi Da and to present His Wisdom Teaching. Adi Da had a great regard for the Kagyu tradition, especially in relationship to the Spiritual Masters, Marpa and Milarepa. As a major gift, a hat was prepared that was made entirely out of white silk and that included a very large diamond right in the center. Joan Hammerschmidt made the hat. 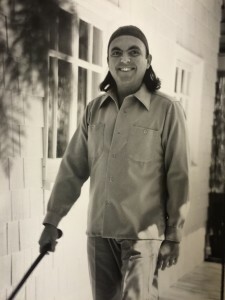 One evening, just before leaving for Boise, Idaho, Craig Lesser and I met with Bhagavan Adi Da in Bright Behind Me, where Adi Da was then residing, to go over the trip with Him. I had brought a picture of the Karmapa for Adi Da to view. He looked at it intently for quite a while and then He said very pointedly, “I am the kind of person who can tell that he is the kind of person, who will be able to tell who I am. The secret is that you bring his attention to it.” Adi Da looked at and admired the white hat, and then for a moment put it on His Head. 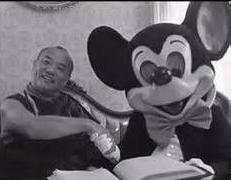 It was clearly His Blessing of this gift for the Karmapa. He gave a big warm smile as He looked at Craig and I with the hat on His Head. And then He took it and placed it in the square white box that was prepared for it. This was wonderful Instruction, which allowed me to understand a great deal about how such great beings, including Adi Da operated. They might hear about something in passing only, and therefore not put sufficient attention on that matter to “get” its significance. So many things might come their way in the course of any day, and because they were alive on many levels and not just the material dimension, they would notice things that a normal person might not. But in order to full receive the import of many things, what was required was their focus be brought directly to that matter. The extraordinary awareness that they had to see the deeper levels of things required that they really give something their attention. We brought with us to Boise, also a very large framed 16″x20” murti photograph of Adi Da, so that in viewing Adi Da’s Picture, he would have the opportunity to really see Him. Until the Valley Fire I still had the script which outlined the introduction to Adi Da and Adidam that I verbally presented to the Karmapa. We spoke through a Tibetan devotee of Karmapa who served as translator. And also there was Jamgon Kongtrul, a great lama in his own right, and a principal lineage holder in the Kagyu tradition. So there were the five of us. We were on the second floor of the Open Path Dharma Centre. Karmapa sat on a raised platform-like chair, and the rest of us sat on the floor before him. The meeting took place on a Saturday in the afternoon, and we had told Adi Da the exact time of the meeting so that He could have His Attention on it. When we presented the Murti of Adi Da to the Karmapa, He did a double take. In other words he looked at it, and then he turned his head away, and then he turned and looked again at it with great intensity. It felt like he could not believe what he was looking at at first, but then got it, received the Darshan of Adi Da. It felt like the moment where his attention was brought to Adi Da. As Adi Da had told us he would, he could tell who Adi Da was. Because he became immediately very happy, and began laughing and smiling as he continued to look at the picture. Very animated and alive. He was totally energized by seeing Adi Da’s Picture, and of course at this exact time, Adi Da had His Attention also on the meeting and on Karmapa. The whole room was filled with wonderful Presence. From that moment on, the mood of the meeting was everything for which we could have hoped. The Karmapa very eagerly listened to all we had to say. It felt like a real and genuine connection was being made between these two extraordinary beings. His laughter and happiness was infectious and he gave instructions as the meeting went on, for the other monks that were with him, to also view Adi Da’s Murti. They were in a room just adjoining the room we were in, but around the corner. When the Murti of Adi Da was brought into the room where they were sitting so that they could view it, we could hear their “oohs and awes” and happiness, and they also were laughing. They too could feel that something really special was happening with this meeting with this Master, and Karmapa was including the lamas who traveled with him into this remarkable event and its energy. There was a great deal of very high Dharma described in my presentation. I went through Adi Da’s Own Sadhana and Life. And also the Sacred History of His Work. I described His Realization in terms that were very akin to highest Buddhism. I talked about the transcendence of attention itself. His Holiness Received all of this very warmly and with what appeared to be full comprehension. He made periodic comments as the presentation was being made. When He received the white hat, he really lit up, especially when he noticed the large diamond. He immediately also put it on his head for a moment, smiling and beaming with reception of Bhagavan Adi Da’s energy that came with the hat. As Adi Da Requested, we invited him to see Adi Da at the Mountain of Attention. Adi Da had given already lots of instructions for hosting the Karmapa and the monks in his traveling party there when He was also present. He suggested in these notes that there was nothing that He and Karmapa had to “do” with one another. It was really more just like being in the same space. Maybe we should just “watch TV together” Adi Da joked. The Karmapa immediately and warmly accepted the invitation to come to see Adi Da. He was very definite about it, and very happy. 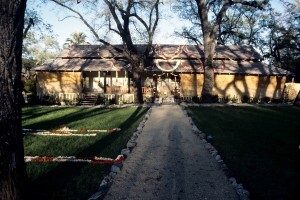 At Adi Da’s Instruction, we also mentioned that Adi Da might be at Da Love-Ananda Mahal at some times, and that this was our second Sanctuary, and that he was invited to visit there as well. The Karmapa immediately said that would also come there, for sure. He said that this particular tour that he was presently on, was already fully arranged with all of its itinerary. But the very next time that he came to the West, he would come to see Adi Da in both places. You could feel how he relished this idea. We also asked Karmapa a question about Adi Da’s past lives. 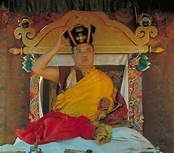 The Karmapa has the role within the Kagyu tradition of identifying tulkus (lamas who have intnetionally reincarnated from a previous lifetime) and is known to have that particular psychic skill. We told him that Adi Da had suggested His deeper personality pattern connected with Marpa Lotsawa, and asked him if he had any feelings for this, based on his own function as an identifier of past life connections. a, was a disciple not of Marpa or Milarepa but of Milarepa’s disciple Gampopa. 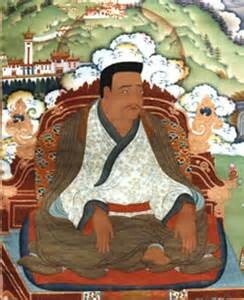 Therefore, the Karmapa himself extended back only so far, and not to Marpa’s time. This whole discussion was very straightforward. 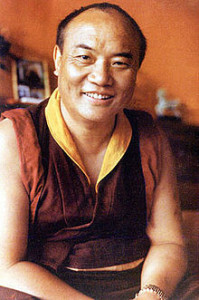 It was clear that the Karmapa had accepted Adi Da and His Realization at such a depth of recognition, that it was not unusual to ask him about Adi Da’s possible identity with one of the greatest figures in his own tradition. It just felt like an interesting question. 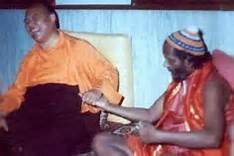 But it felt that the relationship between the Karmapa and Adi Da had already been established at a depth deeper than any kind of verbal discussion. d gone well at the deeper level connection between Himself and the Karmapa. This was not something that Adi Da often said. He listened to the details of the meeting, but said that He already knew what had happened. He was pleased with the meeting. 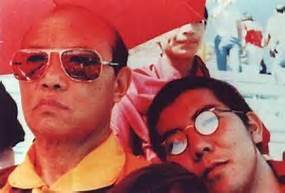 What it felt like to me as one participating in this meeting, was that the Karmapa was free enough so that he could “meet” or connect with Adi Da prior to human politics, or lineages, or religious or Spiritual Institutions. 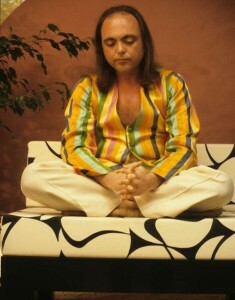 His involvement was simply at the level of direct recognition of Adi Da and connection to Adi Da. It felt to all of us that something very simple but really profound had happened at this connection being established. It was happy and positive, like it should truly always be, but usually wasn’t. The next morning, Sunday, we were invited to attend a Black Crown ceremony with the Karmapa in the same house. It was downstairs in the main Shrine room, and there were perhaps 60 people there. Even with this small group for the Black Crown ceremony, it was done with full pomp and show. The highlight of the ceremony is when, with Tibetan trumpets blaring, the Karmapa takes the Black Crown from its box and puts it on his head. After the Black Crown ceremony, we flew by airplane back to San Francisco. Adi Da asked to meet with us there at Andrew Johnson’s house, to continue the discussion about the meeting with the Karmapa. And as He said it, with an edge of criticism, He “got me” for an instant. Of course, after that first second I realized He was joking around, but He had undermined me and put me beyond any fixed orientation. And having just seen the Karmapa that weekend, and even that morning, I realized that the Karmapa could not have done this with me. He was just too Tibetan. I had read a lot of Tibetan books in preparation for meeting the Karmapa and the teachings, translated into English and often explained in easy ways to receive. This all made it seem to me that Tibetan Buddhism was simply another Spiritual offering. But when I met with the Karmapa himself and heard him speak, in the Tibetan language and with his Tibetan mannerisms, I realized that he was from a completely different and foreign culture, a totally different idiom of expression. And I knew that I needed a Teacher or Master who was going to be able to know me and understand how I operated. Only in that way, would he be able to serve me and deal with me where I truly “lived”.